After the SBL conference in San Diego, I flew up to the Bay Area to visit my daughter Liz and her husband Brian. It was a delight to see them both, since I hadn't since shortly after the wedding. We paid a visit to the Stanford campus (where Liz is a grad student in Classics), the Googleplex (where Brian works), City Lights bookstore, the cable cars, Union Square, and the Haight. On Thanksgiving Day, we enjoyed a genuine feast courtesy of one of Liz's fellow students (thank you, Micah!) and then had dessert with the multitalented Patrick Hunt and his gifted family, where I got another free book (thank you, Patrick!). After a packed and eventful week, I flew home, catching a cold on the plane. Only now am I beginning to emerge into full sentience again. Best Meal: This is a tough one. I'll have to say the tofu stir-fry at Wild Note, but the huevos rancheros at Croce's was (were?) also really good. Not to mention Brian's pancakes. Well, and Micah's feast, of course. Dang it, it was good eatin' all the time, even the hot dog at O'Hare. Best discussion: Again a lot of competition. But I'll give the nod to the "Man in the Moon" convo on Micah's porch between me, Liz, and Brian. I also bent a lot of ears (and bored many, I'm sure) with my recent thoughts on popery. Worst Transportation: The SBL shuttle buses were fine when they stopped, but on more than one occasion they roared past me at the hotel, although I was standing by an official SBL shuttle bus sign. This forced me to walk from the Sheraton Suites to the Convention Center (not bad — about 1.5 miles), in shoes not made for long walks. My feet still have the blisters. Scariest Moment: When the taxi driver taking us to see Suzanne Vega in Solana Beach pulled out his map book and began to study it, while driving. At night. In traffic. On the I-5, at 75 mph. I lived through it, somehow. Most Humbling Moment: Finishing 3rd in a 4-handed game of Scrabble. A good week. Better than Philadelphia, that's for sure. See you next year in Boston. My, what a busy week. Friday I arrived in San Diego for the SBL meeting, and attended (briefly) the Accordance seminar that night, much the worse for wear from jet lag. Saturday morning I had coffee with JT; we discussed sola Scriptura and bird watching in Korea, and he kindly gave me a copy of his latest book. Later I had lunch with the estimable Targuman, and dinner with my co-authors Marty and James. After that we went to see Teddy Thompson and Suzanne Vega at the Belly-Up Tavern, where a good time was what all of us had. Sunday was devoted to the business at hand, namely conversations with prospective employers and prospective publishers. These were very positive; and as soon as I have something concrete to report, I'll report it. In the evening I went to the Dead Sea Scrolls exhibit at the San Diego Natural History Museum. I would give this exhibit a B-plus overall. The set-up was nicely done, the scrolls were displayed to good advantage, and the information was solid — although the recurrent interpretation of Locus 30 of Qumran as the "scriptorium" was not presented with the necessary reservations, and no doubt would mightily vex the soul of Norman Golb. Nevertheless, I would give the exhibit I saw a few years ago in Chicago a better grade, simply because of a better walk-through arrangement and more actual physical space (much of the space, in San Diego, was wasted on photography that was minimally relevant to understanding the scrolls, but which seemed to encourage tourism to the Holy Land). Monday was more of a day of rest; the Fuller breakfast, lunch with the Targuman at the Tin Fish, followed by the Aramaic Studies session, where a couple of hapless presenters were tossed and gored (deservedly, I fear) by a senior scholar. But in general the session was excellent. Tuesday I had breakfast with MMT, made a last visit to the book exhibit, and then escaped to the Bay Area. I'll pick up the story at that point in my next post. 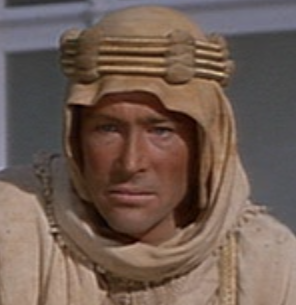 Last week I watched, over the course of several nights, Lawrence of Arabia (1962). They just don't make movies like that anymore. I don't think they even make theaters big enough to show movies like that anymore. I lunched with Beckett in All Souls. He advised me to try for a fellowship there. We fed in the buttery with a man called Lawrence (formerly of Jesus) and an older one whose name I did not catch. Both were most interesting and agreeable. We drank beer bottled in the 19th century: it is clear red, tastes and smells like toffee, and is very strong. During tea Beckett talked of his mysterious colleague Lawrence. He started the Hejaz business and got a job in the Foreign Office, which he held for a time, refusing to take any salary, but soon dropped it. He then took his Fellowship, but again refused the money and hung about All Souls, never dining in Hall, and haunting the Common Room of evening in ordinary clothes, talking very well when he did talk, but far more often silent. Now he has gone back to the army as an infantry private soldier under an assumed name. He is believed to have no private means to speak of: no man is intimate with him. Beckett was Eric Beckett, later legal adviser to the Foreign Office, who helped shape British policy in the Middle East. File this under "Conversations You Wish You'd Heard." BIBLIOGRAPHY: Walter Hooper, ed., All My Road Before Me: The Diary of C. S. Lewis, 1922-1927. Harcourt Brace Jovanovich, 1991. Readers who need a good laugh are encouraged to read Alan Jacobs' review of Kahlil Gibran's Collected Works.